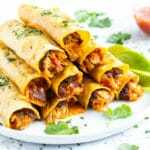 Baked Chicken Taquitos recipe is an easy and healthy appetizer to serve for a Cinco de Mayo party! Pre-cooked shredded chicken gets mixed together with diced onion, chunky salsa, refried black beans, and cheddar cheese for a quick Mexican food recipe. In a large saucepan over medium heat add olive oil, diced onion, bell pepper, jalapeño, and crushed garlic. Sauté for 3-4 minutes, or until vegetables begin to soften. Add shredded chicken, salsa, cumin, paprika, cayenne pepper, salt, and pepper to the skillet. Continue cooking over medium heat for 3-4 minutes. While vegetables and chicken are cooking add 1 tablespoon coconut oil to a large saucepan or skillet. Cook 3 corn tortillas over medium heat for 45-60 seconds per side, or until they begin to brown slightly. Repeat with remaining corn tortillas and coconut oil. Place corn tortillas on a paper towel-lined plate to drain until ready to use. Spread 1 tablespoon refried black beans down the center of each corn tortilla. Next, add 2-3 tablespoons chicken mixture and 1 tablespoon shredded cheese. Roll up the filled corn tortilla as tight as you can and place face-down on a parchment paper-lined baking sheet. Make sure it does not touch any of the other taquitos. Repeat with remaining tortillas and chicken filling. Once all corn tortillas are filled, bake taquitos in the preheated oven for 24-26 minutes, or until edges are slightly browned and crispy. Serve baked chicken taquitos with homemade salsa, guacamole, or sour cream and enjoy! Nutritional information is based on 1 taquito per serving. If dairy-free, use dairy-free cheese alternative or leave out cheese completely.